5th Annual Slavic Linguistics Conference. 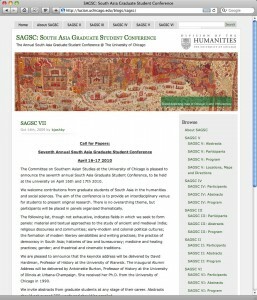 Website for the annual South Asia Graduate Student Conferences at the University of Chicago. This MistyLook WordPress theme based site cleverly organizes each year’s conference as a set of linked pages (one parent page and several child pages). Each packet of pages follows the same structure (Abstracts, Participants, Program, Locations, Maps and Directions) allowing the conferences to be displayed one under each other in the site’s sidebar. Navigating through the site is also helped by the fact the each parent page will (at the bottom of the page) automatically link to its child pages and by the decision to repeat the top level or parents pages in a horizontal menu provided by the theme at the top of the site. While all this may sound complicated it really is not – the adjustments required for this type of page organization are very easy to follow once seen in practice. 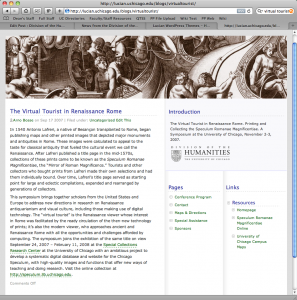 The Virtual Tourist in Ancient Rome symposium brings together scholars from the United States and Europe to address new directions in research on Renaissance antiquarianism and visual culture, including those making use of digital technology. This is a very simple site built on the NigaRila WordPress theme. It has a clean and simple design that relies in large part for its positive effect on the striking nature of the custom header image. A site like this with a solid color header is likely to be visually less effective. 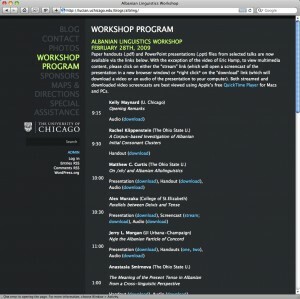 This was one of the first sites we created in WordPress for conferences. Today we would probably structure the site navigation a little differently (using a horizontal menu under the header image for example). However it’s still worth considering as a model as an example of how much can be done with very little effort. The whole site was put together in 20 minutes.